Sometimes you drive two and a half hours to pick peaches only to be told that you're not going to be picking any peaches. No. No peaches for you because everyone else was rude and picked them all. So you can go back peachless or take the ones the orchard-keepers have picked for you. Okay, not so bad. Oh, but you wanted to revisit the spot where you got engaged? Too bad. The orchard is closed, because we are fancy enough to be able to close a section of a mountain. Yes we are. But please, buy another donut. P.S. I'll take half a dozen donuts, please and thank you. Though last Saturday's venture was a bit disappointing, the peaches were nonetheless delicious, because we had not picked them ourselves. I have been baking and blanching and freezing for days, but this simple cobbler was the most delicious reward, and it made the drive worth every minute. 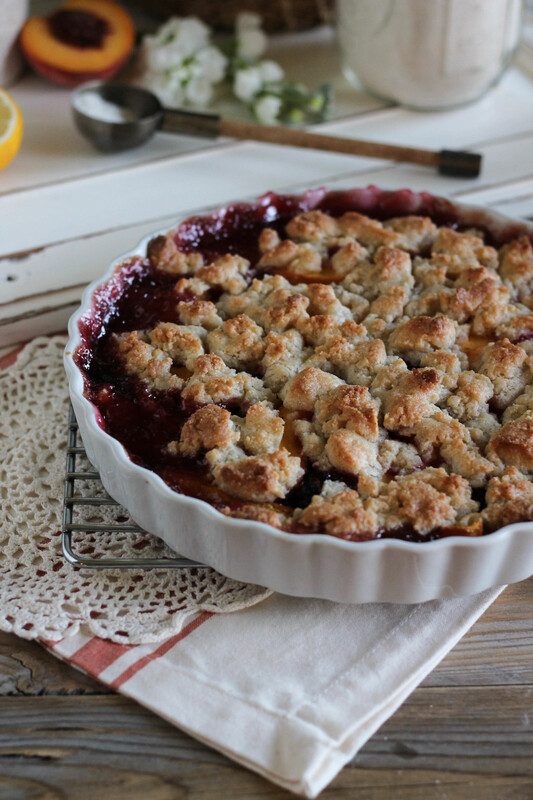 I am always looking for new ways to add more texture to my favorite recipes, and ever since I saw Tracy's Raspberry Cobbler I have had cornmeal on the brain. I love the subtle, but distinctive crunch that it adds to baked goods. Cold butter, cornmeal, sugar, salt, cinnamon, and a bit of all-purpose flour come together in a rough dough after a few pulses. I really love when I can make a crust in my food processor. I have had half of a bag of black cherries in my freezer for about two weeks, so I decided to toss them in with the peaches. Their flavors worked so beautifully together and the colors were more vibrant than my old Lisa Frank notebook. I get unreasonably excited at a chance to blanch peaches, but it is just SO MUCH FUN! Every time I do it and those soft, fuzzy skins peel away with the slightest pull, I am amazed and I have to share my astonishment with whomever is closest. Sometimes that's just snap chat. Blanched peaches happen to be really slippery, so be extra careful when slicing. One third of the buttery, cornmeal crust is crumbled onto the bottom of the pan, making a bed for our fruit that will soak up an excess juices. The remaining crust is pinched into small pieces and sprinkled atop the fruit. This would be a good time to line a baking sheet with foil and place it under the rack that you will be baking on. Bubbling fruit juices have a nasty tendency to drip all over your clean oven. After some quality oven time, this cobbler will be bubbling and that cornmeal crust will have reached a lovely shade of golden. We could call it a day right now, but I felt as thought this bake was begging for a creamy counterpart. This was my snack, my dinner, and breakfast the next morning. It's fruit, so, you know - healthy! In the work bowl of your food processor, combine cornmeal, flour, sugar, salt, and ground cinnamon. Pulse until well-combined. Add butter to the flour mixture and pulse several times, until the butter is in pea-sized pieces. Slowly stream in ice water, one tablespoon at a time, pulsing until a rough dough just comes together. Turn the dough out onto a floured surface and shape into a disc. Wrap in plastic wrap and refrigerate for thirty minutes. Preheat oven to 375 degrees. Place a sheet pan lined with foil on the bottom rack. In a medium bowl, whisk to combine cornstarch and granulated sugar. Toss the fruit in the cornstarch mixture and add lemon juice. Divide the chilled dough into thirds and pinch one third into pieces. Sprinkle in the bottom of 9-inch pie plate. Cover with the fruit filling. Crumble the remaining 2/3 of the dough over the top of the fruit. Bake for 40-45 minutes, on the center rack, until the fruit is bubbling and the topping is crisp and evenly browned. Allow to cool for about thirty minutes before serving. While the cobbler is cooling, prepare the cream. In the bowl of your stand mixer, beat cream on high speed until it holds soft peaks. Beat in confectioner’s sugar and rum until just combined. Serve atop warm cobbler. Enjoy!